A friend recently lent me the book Bird Box by Josh Malerman. It’s a small book, should be a quick read, but it’s taking longer than I thought…since I am no longer reading it right before bed. It’s creeping me out too much. I am still reading it, no way I’m stopping until I get to the end, just not when I want a good night’s sleep right afterwards. But it’s got me thinking a lot about fear and phobias. 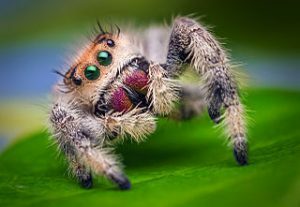 There are some people who won’t want to read this because of the picture of a spider, even if it is a beautiful specimen. Look at her, she so cute, you want to get closer…that’s how she lures you in. I admit, I’m afraid of spiders. Less so now than I used to be, but it caused some discomfort finding that image. I thought at one point I had gotten over my fear. Which leads me to that Costa Rican mountainside. A few years ago, I went on one of these trips to Costa Rica where the company ferries you from one place to another so you can hit the highlights in your 10 days of vacation. It wasn’t exactly the best time to go, since it was still in the rainy season. But I tend to be the type of person who says ‘I want to go now, where on my list haven’t I been’, and pretty soon, I’m off. Oh, and on this trip I splashed out for the single supplement – my own room, oh the hedonism. 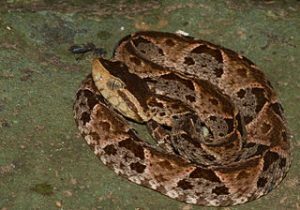 The second day into the trip, we stop at a snake sanctuary, where we see the fer-de-lance up-close and personal – and I ask myself, why am I in my tevas? But seriously, the snakes in Costa Rica are really cool – there’s one that makes like a flower so it can catch hummingbirds, but I digress. After that we head to our accommodation for the night, a last minute swap from a hotel in town to an eco-lodge up the mountainside. Up, up and up the mountainside. The very genial driver starts muttering. My Spanish is minimal and rusty, but I’m pretty sure there’s some cussing going on. But we make it up there. At this point we’re told, by the way there’s no electricity in the cabins, only in the front desk/restaurant building. Seems like a small thing, even in our highly digital world, but it’s an important detail in this story since it means the only light in the cabin is from rechargeable lanterns, or the headlamp I’m really glad I packed. It’s still early afternoon, so some people go off white water rafting. After my experience in Thailand, I don’t do that, so I join some others for a walk in the jungle. We agree to meet up later for dinner. Just before dinner, I go to my cabin to freshen up and use the composting toilet – it’s an eco-lodge. As I sit on the eco-friendly commode, I glance up the wall, which doesn’t quite reach the ceiling. To see a large spider glistening with malevolence. It’s one of these spiders that’s so large and hard-shelled that if I tried to squish it (which I realize is not a very eco-friendly thought), it would just shake it off. I stare at it for a while then realize that I do eventually need to piss or get off the pot, as the apropos saying goes. I decide to make a bargain with the spider. I say, out loud, ‘Spider, if you stay on this side of the wall, I won’t do anything to you’. I take its silence for acquiescence and head to dinner. At this point, it’s started to rain. A lot. As the guide says, Costa Rica is prone to apocalyptic rain. I thought he was exaggerating – he was character. After dinner, I try in vain to avoid the rivers that are forming along the path as I trundle back to my cabin, which I should remind you, I have to myself since I splashed out for the single supplement. I open the door to the cabin and quickly realize that the spider has not lived up to its end of the bargain, as my headlamp is reflected by its carapace (or opisthosoma to be technically correct). Apparently its silence meant ‘f@%k you, this is my jungle, I’ll go where I please’. I muster up my courage and get the water glass from the bathroom, and a brochure I picked up along the way. I get the spider into the glass, then paper over the end…then drop the whole thing out the door. Feat accomplished, fear faced, I get ready for bed in the fading light of the rechargeable lanterns. Getting ready for bed means staying fully dressed and checking under the covers for any other creepy crawlies, then lowering the netting around the bed. Usually when it’s noisy, I wear earplugs – and by noisy I mean if there’s an alarm clock ticking. I always travel with them. But the wind and the rain and the things falling on the roof are so loud, that I figure what’s the point. I get into bed, sparing a brief thought for what might be seeking refuge from the rains in my cabin, and lie in the dark, the spider largely forgotten. Perhaps I am just more afraid of being washed down the mountainside, a tree pinning me down as fire ants and a fer-de-lance had their way with me. I certainly don’t expect to get any sleep. But miraculously I do. I know I sleep because I wake up to silence. And darkness. I give a sigh of relief that the storm has stopped and I seem to have survived. Then something starts chirping. And I realize that the chirping is not coming from outside of the net over the bed. Which leads me to wonder what manner of creature it is, and what else might be in the net with me. Which leads me back to the book Bird Box. I don’t know what the thing is in the Bird Box. As far as I’ve read, I haven’t been shown the thing the character fears. Maybe I never will see it. This is much more frightening than a monster I can see and name and fight. I first heard about Bird Box on my favourite podcast, Stuff to Blow Your Mind. I did look to see if they had a podcast on fear before writing this. They didn’t but a sister podcast did. My fear of spiders is because they are quick and can sneak up on you and shine with malicious intent. My fear of whatever was in that net with me in Costa Rica was the fear of what I cannot see, allowing me to craft it as far as my imagination would allow, which was much greater than that which can been seen and named and squished if you have a big enough shoe. Still my greatest worries that night were of the storm, based on a real and present danger, though perhaps overblown in the darkness. As a side note, despite the guide’s comments about apocalyptic rain, it wasn’t anything near the hurricanes happening in the gulf – I cannot even imagine what those going through Harvey, Irma and Jose are experiencing. My fear of our puny Canadian spiders has returned somewhat, though not to the level it was at pre-Costa Rica. I have even tried to rescue a few, though I always send them outside into the great unknown and often end up breaking a leg, so maybe that’s worse. It’s interesting how the things not seen are the scariest. While traveling in a rural area in Asia and staying at a rather basic guest house, something dropped onto me while I was sleeping. The most-likely-an-insect scurried across me and was gone. I immediately turned on the lights and searched the room, but found nothing. In my imagination that insect was the size of my hand. The power of imagination is amazing, both in creating monsters out of molehills and turning molehills into ramshackle towns on some far-off planet.